Thanksgiving in Sweetwater County by Ciara Knight is the latest in her series from a small town in East Tennessee. After a decade away, Jenna Mitchell Grayson returns to her hometown newly divorced with a special needs child. All she wants is to give her daughter a normal life while she picks up what’s left of her own. Deputy Drew Walker, the town’s most eligible bachelor, never forgot the girl that broke his heart. Now that she’s back he wants answers and another chance. I really LOVE Jenna and Drew’s story. It’s such a sweep-you-off-your-feet romance that is all about second chances. Jenna is pretty broken at the start of the story. Her ex-husband is a real piece of work. Her daughter is autistic and rather than wanting to work with her, the ex wanted to ship her off to an institution, saying it would be better for her. This made the mama bear in me growl but Jenna took care of it and I supported her actions! 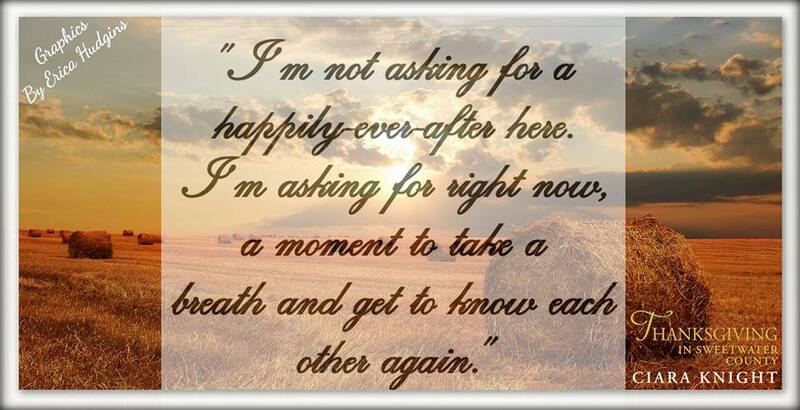 Jenna’s tough, but heartbroken when she returns to Sweetwater County and she is wholly not ready to see Drew. Really I can’t blame her either!!! Drew is the bachelor of the county. He dates, but never seriously. He never got over Jenna and honestly I don’t think he ever tried to. He loved her, planned to marry her, and she left with no word. Or so he thought. Now she’s back and he NEEDS answers if he is ever going to move on. I like Drew! He will make your heart melt after reading his POV for like 2 seconds. He’s perfect! This short novella really revolves around Jenna and Drew, the life they could have had, and what tore them apart. Overall it is well written, heart-warming, and perfect if you’re looking for quick, sweet read. Of the entire series (I’m slowly working my way through them, after discovering them a couple weeks back), Jenna and Drew’s story is my favorite. If you enjoy contemporary, clean romance or you’re looking for a quick read, than this is the book for you!